If you are a fractions genius you won’t need this - but it may still be useful to quickly check your own results. Does what it says - adds, subtract, multiplies and divides fractions including integers, and negative fractions. Simple and quick calculation of multiple fractions. 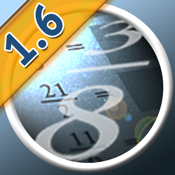 For visibility recommend to limit to five fractions per calculation; version 1.6 now accepts numbers up to 1000 (-1000 to +1000). Wonder about LCM, GCD conversion and improper fractions? KIDS: you need to learn anyway, but EAZY Fractions will help you check that the results of your hard work are correct. ADULTS: don’t worry, those maths days will have passed for most, and now there are other things to worry about. EAZY Fractions will help you out. Currently available in English language version only - but EAZILY understandable to all talking the MATHS language. Developed for iOS 5 and 6; not tested on previous versions. EAZY Fractions presented by appToolFactory.